Today I spent the "mad" money my Dad gave me for my birthday. I bought nine CVM/Romeldale sheep--five breeding age ewes, a breeding ram, two ram lambs and a ewe lamb. These will be a nice complement to my karakul flock. See my page on CVM/Romeldale sheep for more information. Five of the sheep still had tails! It was easy enough to band the lambs' tails but the yearling ewes' tails will have to wait until they are sheared in February/March of 2013. Same face she made when we looked at the carder! "Fuzz Ball," a three year old ram originally from the White Barn Farm. Yes, that's his registered name! "Belinda," ewe with two ram lambs. Belinda was bred by Winterwind Farms. Yesterday, we installed skids under the scotch feed box for the carder in preparation of moving it. Highly scientific method for getting the height of an object. Its going to be a tight squeeze to get this feed box through the shed door. Another tight working space. Again, I offered to crawl back there but Dad wanted to do it. Here's the box on skids and moved into a loading position. The box won't be moved to the farm until after September 15 when the shed is supposed to be absolutely clean (from its current tenant). Today was by far the easiest moving day yet. We started late--1:00--and moved one "small" thing--the last piece to the picker. This will be our last moving for quite awhile. The carder and the other feed box will not be moved until the shed they are moving to is cleaned out. In other news, I finally got the tire fixed for my car--it needed a valve stem. $5! Can't beat that price (and that included the labor). Now I can drive anywhere! I am going to sit back, enjoy some jalapeno poppers and leinies creamy dark beer. Yum! Another day moving. Today we only moved one item but it was a monster! The scotch feed box for the picker was very awkward to maneuver onto skids and then onto the trailer. Today's target--the scotch feeder box for the picker. This machine can take a few hundred pounds of wool, measure it out and place it on the conveyor for the picker in such a way that the picker does not become overloaded or jammed. The box was so close to the wall that it made jacking up one side very awkward. We finally managed to get skids under both sides. And, once again, I'm operating the winch and the camera while Harlan and Dad place rollers under the skids. Success! Loaded on the trailer. All we need to do is tie it down every which way and off we go. With the successful move of this scotch box, we have one piece of the picker left to move along with another scotch box that feeds the carder, followed by the carder itself. I can't believe how quickly we've moved these things! I thought this would take much, much longer. But thanks to Dad, Harlan and Ogden, the moves have gone very smoothly. I'm looking for about 500 pounds of clean, raw wool to use in test driving and calibrating the carder. If you have any you would like to sell (or donate) very cheaply (as in commercial wool price, not handspinning price), let me know. Wool should be professionally sheared, free of tags, mats, and belly wool, low in vegetation and have a staple length of 2.5" to 6". Another productive day moving motors, another piece of the picker and the roving attachment. Today we were joined by Ogden and his tractor to help load. These three phase motors are extremely heavy! Additionally, my crabapple jelly set up nicely overnight--not syrup anymore. I sure hope we remember where all these motors go! When we finished loading and tying down everything, Ogden, Dad and I stopped at Pine Brook Inn for a well deserved lunch (and tasty, too). Dad and I then unloaded the trailer at home with gravity as our best friend. We are very fortunate that the trailer tips up! Today was a quiet day at home. I attempted to make crabapple jelly from my Grandmother's fruit. I think I ended up with syrup. Yesterday was a very productive day in mill history. We managed to move the conveyor to the carder, half of the picker, and the batt roller. Harlan, the former owner of the mill, continues to be a big help! Here's the batt roller that Harlan made situated at the rear of the carder. The picker was bolted to the concrete floor. Harlan (former mill owner) is cutting off the bolts. Here's Dad jacking up the picker so that we can put skids under it. Still jacking up the picker with Harlan. Dad and Harlan putting rollers under the skids as we winch the picker toward the trailer. I'm operating the winch (and the camera). Success! The picker and the batt roller made it home! Project for today: A skirting table made from PVC and plastic netting followed by skirting of four very nice babydoll southdown fleeces acquired in anticipation of getting the mill running. I expect I will use this table a lot when the mill is running. Although, maybe I should have used 2" PVC instead of 1 1/4". Time will tell. Since the auction, Dad and I have been back twice to do more measuring and figuring. 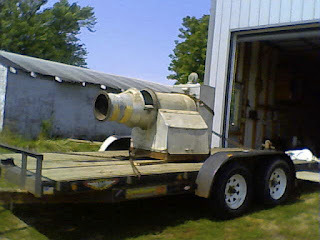 We also have been picking up the smaller, readily moveable pieces--motors, belts, chains, guards, electrical boxes, etc. The move of the large pieces is awaiting clean out of the shed where the carder will be housed. The person occupying the shed was given until August 30th to clean out the south 2/3s of the shed and Sept 15 to clean out the remainder. As soon as the south end is clean, we can start moving the large pieces of the carder and the picker. Did I forget to mention that the mill comes with a picker? 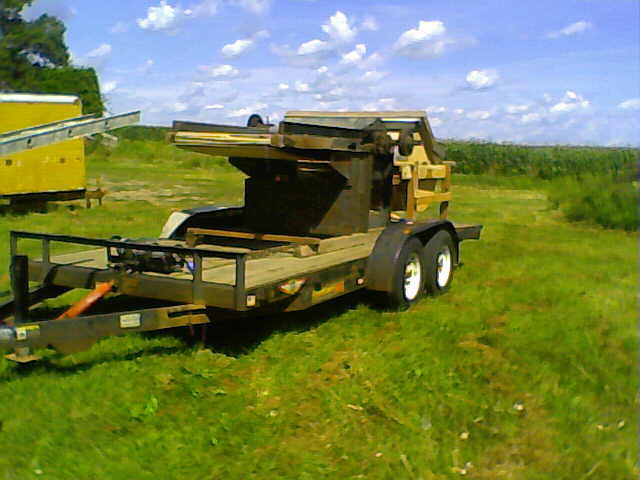 On August 1, 2012, my Dad and I went to preview the carder. Since he would be an integral part of the set up and maintenance of the carder, I wanted to ensure that he was on board for this monster project. We measured, we looked, we estimated, we measured some more, looked, crawled around, peeked here and there and got a very good idea of the size and scale of the project. I tried to tell my Dad that I would pay to have it moved. He replied, "We can move this ourselves!" Later, we stopped for a burger and beer at the Dusty Eagle in Dalbo, MN. We talked about moving the carder. I told him what I thought it was worth and what I was willing to pay to which he responded, "You should think about bidding more." He then said that it would be very easy for the scrap dealers to overestimate the weight of the carder and they would bid accordingly. Despite what he meant, I took that to mean he was on board with this project. Over the next few days preceding the auction, I adjusted my bidding price upwards quite a bit. I thought about how much I wanted to start this business. Custom carding is a business I researched intensely a few years back when a mini mill became available in Wisconsin. I drew up a plan and made an offer on that mill. The offer was turned down, probably fortunately for me, and my plan was set aside but not forgotten. Another custom carder told me that these old carding mills are the way to go. He suggested I buy the one at Cambridge Woolen Mill if it was for sale. Every time I drove by the Mill, I wondered about this old carder. Was it still there? Yes, it was (and is). On the morning of the auction, I determined that this was definitely a business I wanted to start and hoped there would be no one there aside from a few scrap dealers--I was sure I could outbid them! August 4 arrives following a sleepless night. 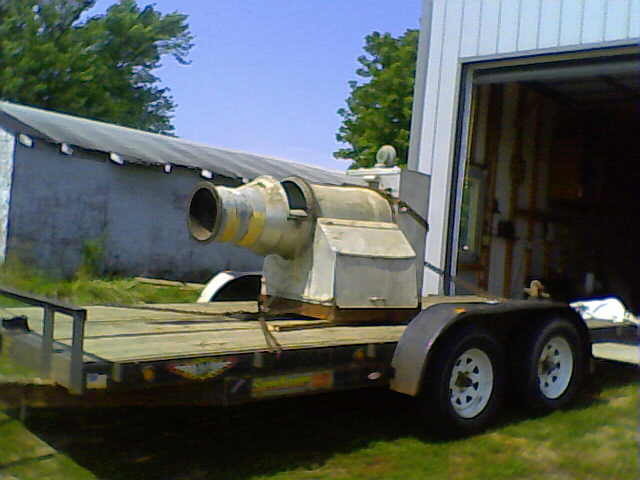 I arrive a the auction site to find several people looking at the mill. One an alpaca farmer fairly close by. I adjust my bidding price up a bit in my mind. Finally, at a bit after noon, they begin the auction on the mill. The starting bid is higher than my first estimation several days ago! I couldn't see who I was bidding against but I prevailed! It was a bit more than I had decided on but this was a once in a lifetime chance for me. I have no regrets! On July 30, 2012, Mom, Becky and I went to preview a 1918 Davis and Furber carding mill scheduled to be auctioned off on August 4. The mill weighs about 8 tons, can make a wool batt 60" wide and from front conveyor to rear batt roller measures over 19 feet long! Becky's reaction to the mill was similar to Mom's. She was overwhelmed by its size. I, on the other hand, walked into the shop and my jaw dropped in wonder and awe! What a beautiful machine and much smaller than I remembered it. Welcome to Old Man Wool Farm, future home of Ewespun Fiber Mill. The 60" Davis and Furber carding mill was purchased August 4 at an auction. It is a single brake, T slot card with rover attachment and scotch feed boxes. A fur picker with blower was also included.